You can’t run your business for a long time without your data. You need a solution in place that keeps it close at hand at all times. Keeping a functional data backup system can become an extremely taxing affair for businesses. Leaving it to us takes the burden off your shoulders while improving the security and integrity of your data. With us by your side, you can access your data instantly. Forget about downtime and lost files – together, we’ll make sure you never skip a beat. You can’t function effectively without keeping copies of your data. 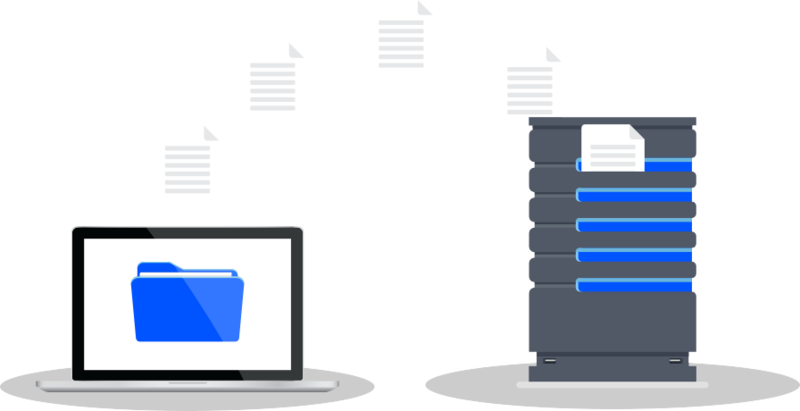 We thoroughly safeguard your data and keep copies both in the cloud and on-site. When disaster strikes and robs you of your data, you can shrug it off and keep things going smoothly. We take great care to test your data backups for full functionality. When the time comes to use them, they’ll be ready to work flawlessly for you. Data backups are the answer to fighting back against downtime. While others may scramble to regain their data, you can keep working as long as you want. Even a single technical misstep can tarnish your name. Data backups prove you’re prepared and responsible to securely handle your client’s data. How do data backup solutions work? Data backups are something you establish before a disaster. With enough time, you can have multiple versions of your data to restore from. If a disaster strikes today, you can have yesterday’s data loaded up and ready to go. We can always modify the backup increments to best fit your needs. When the dust settles, you’ll need to recover from your data. Proactive planning means you’ll come back swinging faster than ever before. No matter what comes your way, we can ensure that you’ll be ready to go. No need to worry about the ifs and hows – we make it work every time.